We last heard from Jeffrey Fortson two years prior releasing his debut album Just a Poet With Soul . The critics praised the album and some even went as far to hail it as a lost hip-hop classic (at least that’s what Wikipedia would lead you to believe). I personally found it quite underwhelming, but you know what they say about opinions. Fast forward to 1991. Jeffrey would return with his sophomore effort, sticking with the soul theme, titling it Soul Food . Soul Food was packed with black consciousness themes and like it’s predecessor, self-produced by Jeffrey. Soul Food would go on to receive modest reviews and needless to say, it failed to move a ton of units. 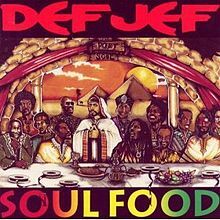 Soul Food would be Jeffrey’s final album as he would hang up his microphone and head to Hollywood (which wasn’t far since he already lived in L.A.) and go on to produce TV show theme songs (i.e. That’s So Raven and The Game). It’s been a while since I listened to Soul Food from beginning to end. But from what I can remember, I’m not too excited about sitting through this. Side note: The cover artwork portrays Jeffrey as Jesus at the last supper with his twelve Soul music disciples. I was able to pinpoint 9 of the 12 (Gil Scott Heron, Jimi Hendrix, Marvin Gaye, Isaac Hayes, Aretha Franklin, Bob Marley, James Brown, George Clinton and… Lionel Richie??) but can’t put my finger on who the guy on the far left is or the two faces in between James and Clinton are (any ideas, drop a comment). I’m baffled as to how Stevie Wonder and Michael Jackson didn’t make it to this table. Even better question is how the hell did Jeffrey make it to the table? Talk about blasphemy. He wouldn’t even be Jesus at the Last Supper painting of Flava Unit emcees. Richie occupies the spot of Judas as the table, which can be interpreted as a shot at him for leaving the soulful Commodores to become a soulless pop superstar. This is one of my favorite cover artwork pieces of all time. A Poet’s Prelude – Soul Food begins with a generic instrumental that barely registers and guest vocalist Kenyatta wailing over it as Jeffrey spits a spoken word piece that leads into the next song…. Get Up 4 The Get Down – Kenyatta returns to sing the same two phrases he sang on the previous interlude as the hook on this one. Over a decent instrumental Jeffrey is in conscious mode as he discusses politics, religion and the American system set up to trap black men. Kudos on the intent but the execution was done poorly. Soul Provider – Based on the song title I was expecting way more from the instrumental. I don’t know, maybe something more soulful. Instead Jeffrey provides an empty backdrop about as interesting as faucet water. Coincidently, Jeffrey’s rhymes match his instrumental. Here We Go Again – Now this is more like it, and truly the reason why I bought Soul Food in the first place. Over a sick jazz tinged instrumental (complete with live bass by Ray Felix and live sax by Scott Mayo) Jeffrey discusses a relationship that he knows is going nowhere, tries to leave, but somehow ends up right back in the toxic relationship. I’m sure most of you can relate. Easily the best song in all of Jeffery’s catalog. Cali’s All That – Jef invites Tone Loc to the studio for this duet that the duo uses to express their love for California. Jeffrey actually sounds pretty decent (which may be credited to the fact he’s rhyming next to Loc) on this one, but as my 16-year-old niece would say, the instrumental sounds basic. Brand New Heavy Freestyle – The instrumental version of this song was included on The Brand New Heavies debut titled “BNH”. I’ve always loved this smooth jazz groove and Jeffrey sound surprisingly nimble as he turns in one of his better performances on Soul Food. Soul Is Back – And then Jeffery follows up with this mess and Soul Food loses all the momentum it built up on the previous song. The instrumental is hot garbage, yo! Shadow Of Def – Jeffrey makes a feeble attempt at sounding gangsta on this one. His generic reggae tinged instrumental is atrocious, even with the live bass and guitar. Pappa Juggy provides a ragamuffin chant on the hook, but that can’t revive this train wreck of a song. Fa Sho Shot – Jeffrey takes off his conscious hat for a bit to discuss the ladies. Jeffrey’s instrumental samples the LTD record that has been flipped a gazillion times over the past 25 years. I’ve never cared for this song in the past and hearing the overused sample today made the song sound even more underwhelming. Don’t Sleep (Open Your Eyes) Theme For The 90’s – Listening to this almost put me to sleep. Soul Food ( A Hip-Hop Duet With Boiwundah/Funkytown Pros) – Jeffrey lays down a nice instrumental and invites Boiwundah to the stu for this duet. Both emcees get two verses a piece and sound decent on the mic, but Jeffrey walks away with this one, on the strength of his first verse. Well done. Voice Of A New Generation – Jeffrey’s content was pretty nice. Too bad everything else about the song sucked elephant balls. God Complex – To close out Soul Food our host samples the instrumental from Gil-Scott Heron’s “The Revolution Will Not be Televised” for the backdrop. Jeffrey goes for the neck of the powers that be in these United Snakes of Amerikkka. This was pretty powerful. Solid way to end the evening. I can’t say Soul Food was a disappointment since I had pretty low expectations going into it. Based on his first album it’s exactly what I expected. Jeffrey is not a terrible rapper, and there are a few songs on Soul Food that he sounds sharp on. Jeffrey’s content is pretty solid throughout, but the majority of his messages are lost in his average monotone delivery, and when coupled with mostly underwhelming production, you get a below average album that is not very entertaining. But that album cover, though.